FINCA PARAISO ARRIBA & FINCA PARAISO ABAJO ARE SPACIOUS, MODERN FURNISHED HOLIDAY HOMES FOR 2 PERSONS (WITH THE POSSIBILITY OF PLACING AN EXTRA BED), WITH A PANORAMIC VIEW OVER THE OCEAN, THE VALLEY AND THE MOUNTAINS. THE MOST BEAUTIFUL CANARY ISLAND ! 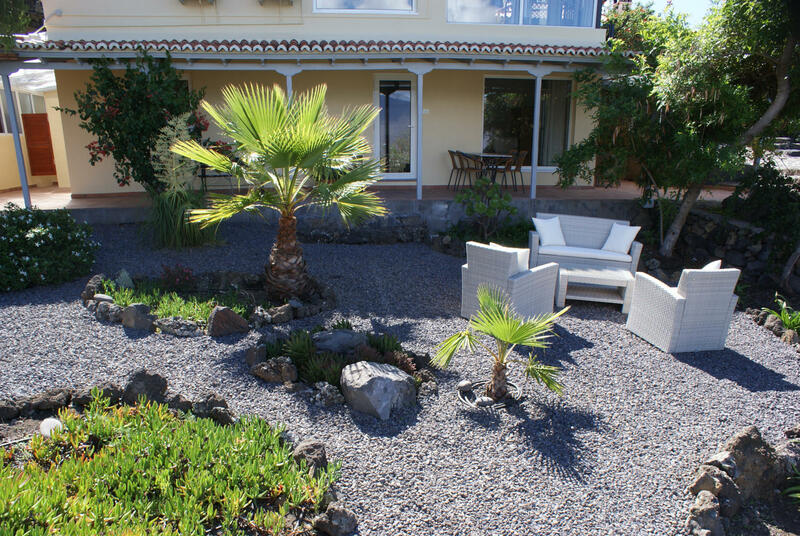 Finca Paraiso – La Palma is located in a beautiful garden of almost 6,000 m2, partially landscaped and partly left in its natural state. The apartments were completely renewed in the autumn of 2018. They have a luxury kitchen, modern sanitary facilities, a new floor, double glazing, air conditioning and a completely new interior. Finca Paraiso Arriba and Abajo are superimposed, because the apartments are built on a slope. But each with its own independent entrance at ground level. Both have a spacious terrace with fantastic views over the Atlantic Ocean and the mountains. Furthermore there is a panoramic terrace in the upper part of the garden with sunbeds and a seating area. And in the small pool you can cool-off on hot days. Suitable for 2 people, with the possibility of placing a good quality extra bed. The apartment has a surface of 60 m2 and offers a panoramic view over the ocean and the mountains. Suitable for 2 people, with the possibility of placing a good quality extra bed. The apartment has a surface of ​ 40 m2 and views over the ocean and the mountains. From every spot on the finca there is a magnificent view of the Atlantic Ocean and the mountains, even from the pool. 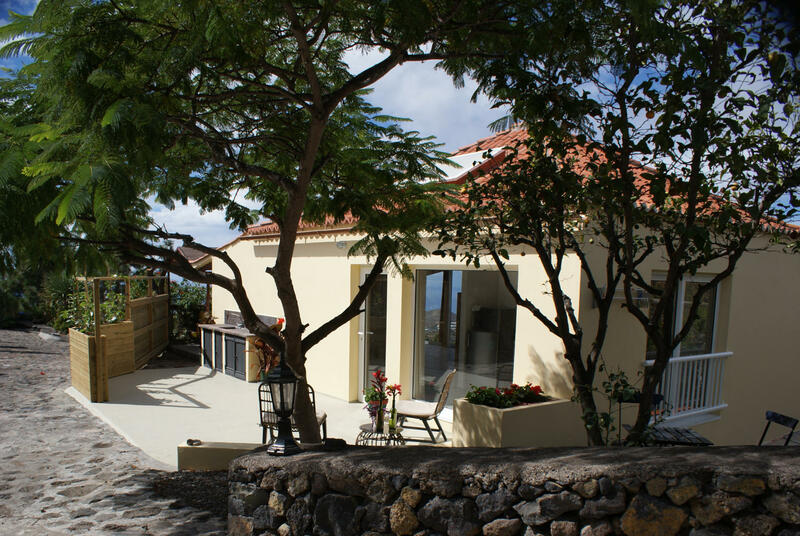 Finca Paraíso – La Palma is located in a quiet area, yet close to the beach, shops and restaurants. And within a 10 minutes’ drive you are at the boulevard of Puerto Naos or Tazacorte and at the cozy Plaza de España in Los Llanos. Within walking distance there is a little shop where you can get fresh bread. Also, there is a Spar supermarket at 3 kms distance. Because of the location of our site on a mountain slope with many differences in level, our holiday homes are not suitable for people with walking difficulties. La Palma, one of the smaller Canary Islands, is also called ‘the island of eternal Spring’. The climate is very comfortable and mild. The temperature on the coast rarely falls below 20 ° and does not often rise above 28 °. Whilst at the top of the Roque de los Muchachos there can be snow in Winter. But in the higher areas the temperature varies somewhat more, so the winter evenings and nights are fresher here. 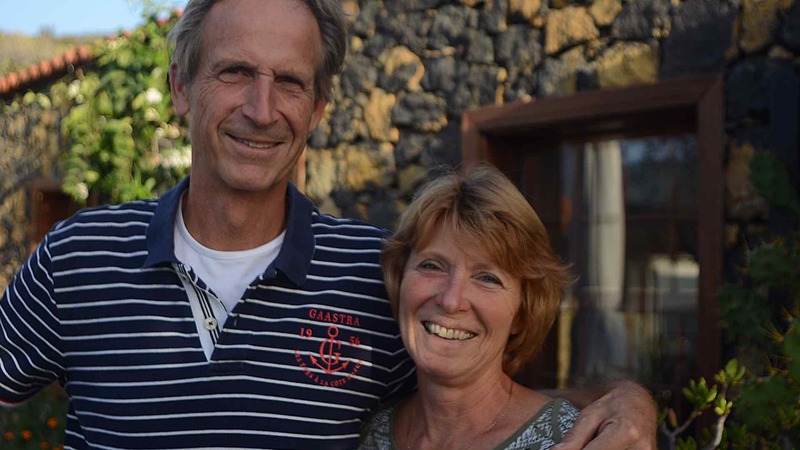 For many years we have spent our holidays on la Palma and from the beginning, we felt very at home on this beautiful island. That is why we made the decision to put our hotel up for sale. 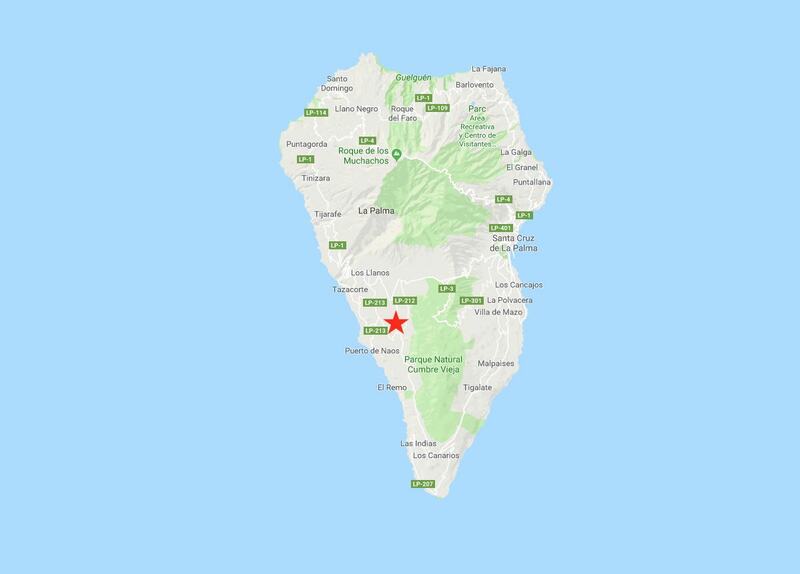 So in February 2018 we sold Manoir Bonpassage and subsequently bought Finca Paraiso on La Palma. Our belongings were put in a container and we ourselves drove with the car and the dog to Cadiz for the crossing. In March 2018 we started with the complete renovation of the holiday homes. And in October 2018 we welcomed our first guests. We have left behind the hectic pace of life in the hotel business in France. But we have always enjoyed having people around us and would not want to miss out completely on the interaction with our guests. So with the rentals of our two holiday homes, we think we have found the perfect solution. Because we are now living in a lower gear, since our guests are completely autonomous and our continuous presence is no longer necessary. But we are nearby when needed or desired, as we also live on site. Gladly we will tell you about the island and which are the best spots. Also we will give tips where you can eat well and we can inform you about beautiful walks, nice places to visit, etc. We look forward to welcoming you at Finca Paraíso – La Palma! Note: If you use a navigation system based on Google Maps, please note that Google Maps doesn’t know the ‘Camino El Paraíso’. In Google Maps our street is listed as ‘Camino Paradiso’. So search for Camino Paradiso and not Camino El Paraíso. There is also a ‘Calle El Paraíso’, to make it easy . This street is nearby but is not ours! If you leave the parking at the airport, follow direction Santa Cruz / Los Llanos de Aridane. Take exit 2A in the direction of LP2 to San Pedro / Los Llanos de Aridane (the sign is somewhat hidden behind a palm tree, the exit is quite suddenly). At the roundabout take the 1st exit towards LP3 – Los Llanos de Aridane. The road meanders uphill until you reach the tunnel. On the way up you come across a Lidl and a Mercadona supermarket, if you want to do some shopping. Follow the LP3 down through the village of El Paso. Attention: at the visitor center of the Parque Nacional Caldera de Taburiente, before you enter El Paso, there is a flashbox, you can only drive 50 km/hr. At the traffic light in El Paso, there is a Hyperdino Supermarket on the right, in case you missed the Lidl or Mercadona. Follow the LP3 further down. You pass a dentist on the right, Clinica Dental Dos Palmas. A short distance after the Clinica Dental there is an exit to the left, LP2, direction Las Manchas / Fuencaliente / Los Canarios (at the corner on the left you will see Restaurante Sombrero). Go left to the LP2. Pay attention when turning left, after 5 meters the right has priority ! Follow the LP2 for about 2 km, the road meanders a lot. Approx. 600 meters after the kilometer-sign 43, there is a bus stop (guagua) on both sides of the road. A few meters after the bus stop you turn right into the Camino El Paraíso, a narrow street with black walls on both sides. The street name sign cannot be read from this side, is only printed on the reverse side. But the street that goes up on the left is Calle Alcala and on the left is a white house with ‘Paraíso’ written on the wall. Here you drive down on the right. You will find Finca Paraiso at number 19, about 400 meters downhill on the left side. Just before the parking there is a white water tank above the wall. Our car is usually parked here (silver-gray Nissan X-trail), if you drive a few meters further, there is a 2nd parking area for 2 cars. The door-bell is situated on the fence at the 1st parking. But a hooting also works !